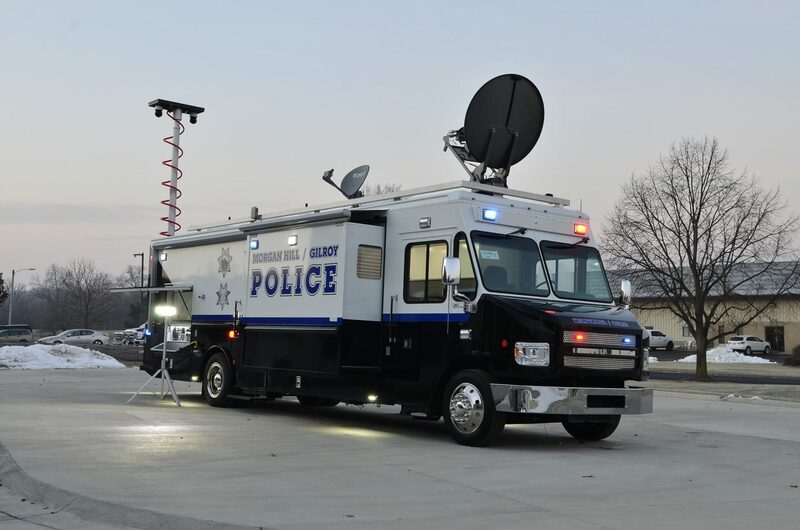 Morgan Hill/Gilroy Police Department recently took deliver of their new mobile command center. The vehicle is built on a 250" wheelbase Freightliner MT-55 chassis with 26,000lb. GVWR and rear air ride suspension and is powered by a Cummins ISB 6.7L engine. The body is a 26ft. long, all aluminum step van body for maximum durability and features dual slide-out rooms to increase interior working space. There are storage boxes built into the body as well. Inside, the mobile command center features our exclusive Intel-I-Touch™ vehicle automation control system, a galley-style kitchen with microwave, Keurig™ coffee machine, Norcold 2.7 cu. ft. AC/DC powered refrigerator and more. Additionally, the truck features a conference area with stowable spider-base office chairs, four dry erase white boards, custom fabricated storage cabinets, a low-profile Coleman A/C unit, DirecTV, Digital HDTV antenna workstations with radio communication and more. On the outside of the vehicle, a weatherproof workstation has a TV monitor, USB charging hub, CAT6 jack, GCFI outlet, HDMI input and more. The truck also has a telescoping mast at the rear with dual mast-mounted cameras. There are also five perimeter cameras that keep tabs on the vehicle surroundings. A host of Whelen sirens and lights round out the emergency equipment.